Mori Gallery is right off the beaten track, beside Sydney's Western Distributor near the Entertainment Centre, and doesn't often associate with Aboriginal art. But the Warburton community is such a law unto itself, any show is of interest. Most art made there is locked away in a Community Collection that only visitors to the Gibson Desert get to see. At Mori, though, two huge and beautiful canvases by Belle Davidson are on show - but not on sale! At one time Warburton artists also made amazing slab glass works which they did share with the world - from huge bowls to decorated panels. But that now seems to have gone by the wayside. And much of this show is more 'urban' than Desert - with videos of life in the community, still photos of young people looking Deadly, graffiti texts on canvas and naive paintings on subjects like The Intervention that offer little of the richness of traditional story-telling. 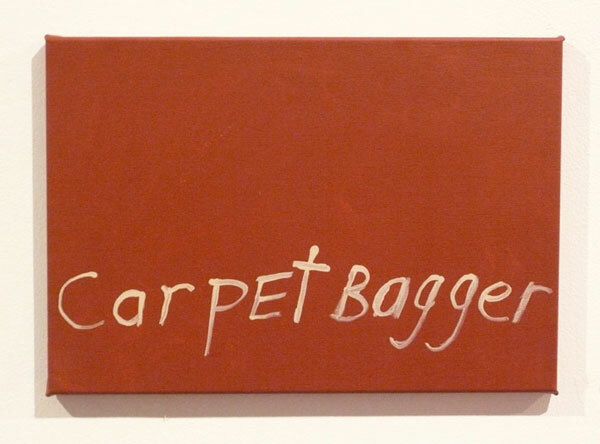 And they're not all by young people - June Richards, creator of 'Carpet Bagger' is, I'm told in her 50s. And that work is for sale at the steep price of $3000. Clearly, Warburton is a comunity that does not bow to market forces.